Lots of things have been happening in the world of literature, but don’t worry—as always we’ve got you covered with news from far and wide. Maíra Medes Galvão serves up a rich helping of literary festivals and events around Brazil (and New York), including a celebration of Bloomsday. Sneha Khaund gives us the who’s who and the what’s what of India’s literary scene right now, including recently published authors and the most exciting literary readings and events. Stefan Kielbasiewicz provides some tragic, but at the same time uplifting news, and gets into the thick of prizes and festivals that have already happened and all that are yet to come. Strap yourselves in and enjoy the ride. As a plea to encourage people to acquire the habit of reading—famously said to be lacking in Brazil—four literature and entertainment blogs from Belém, capital of the State of Pará, have put on a literary festival dubbed a ‘Cultural Marathon‘, which started on June 17 and goes on until the 25th. There will be talks around themes such as sci-fi, the detective & crime genres, new Brazilian literature and others. The festival is hosted by the bookstore chain Leitura and supported by publishing houses Intrínseca, Pandorga and DarkSide. Bloomsday did not go by unnoticed in Brazilian territory. The city of São Paulo traditionally holds its June 16 celebrations inspired by the initiative of brother poets and translators Haroldo and Augusto de Campos, who first brought the festive date over to São Paulo thirty years ago. Casa das Rosas, a cultural venue and museum dedicated to Haroldo de Campos, and Casa Guilherme de Almeida, dedicated to the eponymous translator and poet, have come together again this year with a program that included a festive wake (Finnegan’s wake, naturally) with live Irish music as well as conferences, talks and readings. This week we bring you news from Spain, Slovakia, and Brazil. We will begin our journey with Editor-at-Large Carmen Morawski who captures the excitement leading up to the Madrid Book Fair. We will land next in Slovakia where Editor-at-Large Julia Sherwood updates us about the buzz surrounding the country’s most prestigious literary prize, Anasoft Litera. We will finish our journey across the world in Brazil to read Maíra Mendes Galvão’s report of writers’ protests against the impeachment of Dilma Rousseff. In its seventy-sixth year, the Madrid Book Fair (Feria del Libro de Madrid) has yet again marked the transition from spring to summer for Spanish book lovers. Taking place in the Buen Retiro Park in Madrid from May 26 to June 11, this year’s fair will open with a lecture by Eduardo Lourenco, the Portuguese essayist and philosopher, in the Pabellón Bankia de Actividades Culturales. 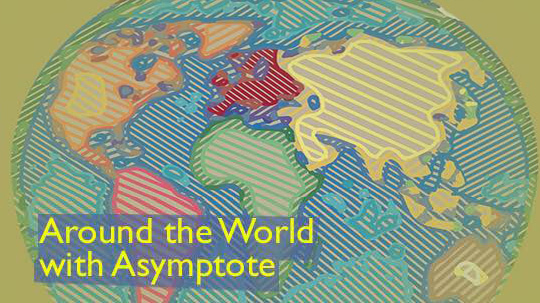 Although a detailed schedule for this year’s fair isn’t available yet, a glance through last year’s schedule should give Asymptote readers a flavor for the lectures, readings, and other events typical to the fair. Whether on the look out for children’s literature, YA or adult fiction, non-fiction reportage, essay collections, philosophy, specialty and minority literatures, visitors to the fair can browse a wide array of contemporary offerings from the Spanish publishing scene, take advantage of special discounts, and even meet a favorite author at one of the many book signing sessions. If you want to learn more about the history of the fair and are interested in sampling previous years’ fairs, you may enjoy this brief video of the 2014 fair. Asymptote readers interested in more historical literary fare might prefer to visit the Spanish National Library’s (Biblioteca Nacional de España) special exhibition, Scripta: Tesoros manuscritos de la Universidad de Salamanca. Intended to commemorate the 800-year anniversary of Alfonso IX’s order to create ‘Schools in Salamanca,’ that in turn led to the founding of the first universities in Europe, the exhibition showcases 23 pieces spanning the history of the manuscript in Europe, from medieval Visigoth codexes belonging from the eleventh and twelfth centuries through the sixteenth century. The exhibition is on loan from the University of Salamanca and is divided into four main sections. It includes a section devoted to Humanism and the Vulgate languages, thereby acknowledging the prominent role of romance languages derived from Latin as vehicles for literature and scientific works. The exhibition runs from May 4 to June 4.